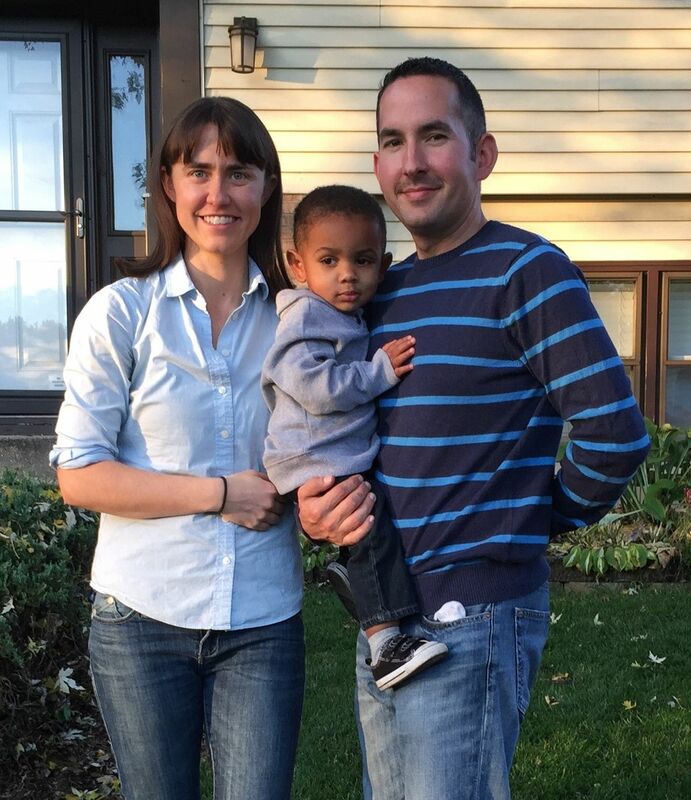 Tell us about who is in your family: My husband, Jon (or “the cop” as I typically refer to him), and I have been married almost 5 years, and we adopted our son, Lucas, in August of 2014 when he was 5 weeks old. We also have a dog, two cats, and three chickens at home. Current/Previous Career: I have worked for Kellogg’s for almost 12 years and am currently the Director of Business Planning for our Morning Foods division, which basically means I lead a team of people who are responsible for promotional event planning for cereal and Pop Tarts. What was your childhood ambition? I always said I wanted to be a “rock and roll veterinarian,” which in my head was a veterinarian by day and lead singer in a rock band by night. However, around age 8 I realized that being a veterinarian sometimes involved euthanizing animals, which terrified me…but even more importantly, I realized that I can’t carry a tune to save my life. What does motherhood mean to you? Very simply, motherhood means everything to me. Before we were matched with Lucas, I worried about so many things as it related to adoption and motherhood. What if we were never actually matched with a child to raise? Was I okay never being a mother? What if we were matched with a child with significant special needs? Given that careers outside the home are important to both of us, were we prepared for the challenges that would bring? And the biggest worry I’m sure we all share – what if it turns out I’m just not a good mom? However, motherhood has changed all of that. Lucas ended up coming to us with a lot of unknowns. He was born premature and addicted to heroin. His birthmother originally wanted a closed adoption but has communicated with us fairly frequently through letters and gifts. On the surface, it all sounds very complicated…but motherhood has taught me that the complications are all in my head. I watch Lucas go through his days worried about nothing more than whether he can talk me into French toast sticks for dinner, and he loves me unconditionally when I give him green beans anyway. What could possibly be more fulfilling than that? What is the furthest you've been away from home? In October of 2015, I spent a week in Costa Rica with a friend tutoring kids in a rural school. We stayed in huts in the middle of the rainforest, shared those huts with spiders as big as my hand, and made some amazing memories. How has FIT4MOM changed your life? We had moved to Glen Ellyn about a year before I met Emily this past summer, and between work, working on our house, and physical therapy for Lucas, I had all but stopped doing anything for myself and felt stuck in a rut. FIT4MOM has been awesome in that it gave me a reason to do something just for me a few times a week, and being able to do that with a bunch of other cool, like-minded moms has been an unexpected bonus. I never realized I was missing a Village until I found one. Favorite Exercise: I love Tabata workouts, and I love squat hops. And, I realize that this wasn’t asked, but I have to let the world know that I hate star jacks. I have no inner cheerleader to channel for those, so you’ll notice I always stick to regular jacks! Proudest Moment: By far, my proudest moment is the first time Lucas called me “mommy.” For months prior to that, he would call me “ball” and then laugh like he had said something hysterical. But then, one night as I put him into his crib, he said “mommy kiss,” and my heart melted.